Aaron and Lynnette chose the Mission Inn Marina in the gorgeous Howie in The Hills, Florida. That setting features one of the most spectacular lake side vistas in the Central Florida area. There are tall Bald Cypress trees with hanging Spanish Moss! The setting is so reminiscent of “old Florida” and is perfect for a wedding cerebration! 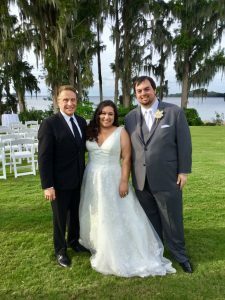 Lon Tosi from the Orlando team of Sensational Ceremonies worked with the couple for many months to build just the ceremony of their dreams. Lon works out of his hometown of Celebration, Florida. (the town that Disney built) It is notable that Lon also married Lynnette’s mother a number of years earlier, which made the entire affair even more emotional and poignant! The ceremony itself included language that focused on the love of the couple The wonderful reading “What is Love” started everything off with it’s focused language including the following phrase that had everyone crying: “Love is a promise that is always kept, a fortune that can never be spent, a seed that can flourish in even the most unlikely of places”. So beautiful and true! The couple included readings to each other expressing their love. Lon read those words of love for them. Lynnette, among other things, spoke of how his love for her has changed her perspective on life. She promised to say “I Love You every day! Aaron wrote of his deep love and gratitude for having her in his life! The couple planted a “love tree” to signify the nurturing and care that will keep their marriage strong; just as it will keep the tree that they planted healthy and vibrant! The marina back lawn where the ceremony was held is wide-open. There are birds of all sorts and sometimes even a boat comes along. In effect, there is ambient sound surrounding the venue. So, it was important that Soundwave Entertainment applied their expertise in having Lon, Aaron and Lynnette sound spectacular! The entire audience of 100 close friends and relatives heard every word! Scott David Photography captured every moment for the couple and Cine Media captured every movement. We can’t wait to see both the photos and video of the event! Of course, the amazing Atmospheres Floral and Decore did their usual over-the-top service with their gorgeous florals. Party Flavors provided a “huge and amazing cake” as they usually do. And their cakes are as good as they look! The ladies in the bridal party looked so beautiful due, to the hair and makeup artistry of Flawless Faces by Alicia. David’s Bridal provided the stunning gown worn by Lynnette. Just perfect. Last, but not least, Jessica Maertchik from the Mission Inn Resort kept everything running smoothly as she usually does. In all, it was a stupendous evening of fun and love! Congratulations Mr. and Mrs. Mayland! You are a fantastic couple off on a fantastic adventure together!